A level is a vital part of any tool kit, but there are lots of different types. We explain the different types of spirit levels that are commonly used in construction and home improvement projects and how you can use them most effectively. We will give you tips for using all types of bubble levels including box levels, scaffold levels and torpedo levels. We also show you how to check the accuracy of your level so that you can have complete confidence that it is giving you an accurate level. Getting things level (or vertical) is a critical part of any construction project and for a lot of home improvement ones too. The level is one of the most useful and important tools in any toolbox. The aim of this project is to explain which type of level you should use for different types of jobs and how to use a level effectively. device for establishing a horizontal plane. This is a clear definition as any; succinct and correct. Most levels can also be used to find a vertical plane also, generally in exactly the same way as finding the horizontal plan. 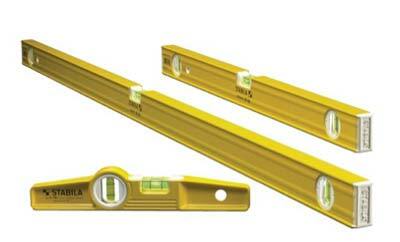 There are many different types of levels that are used in different circumstances, of which the spirit level is one. We will cover the main types now. We will explain the different types and also how to use a level in greater detail below. As the name suggests this is a level that uses a laser to project the level on to the surface that you need to establish the horizontal plane. The more expensive and sophisticated devices will show the vertical plane also, which can be very helpful. We will not cover these here, as we have an excellent project all about using laser levels that you should read. 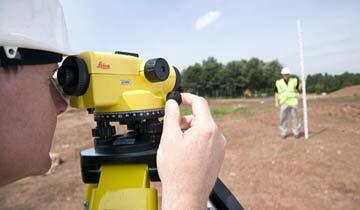 These are tools that are generally used by surveyors and builders on larger construction sites where a level plane needs to be established over a long distance, such as across the whole building site. 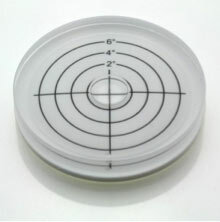 When using an optical level, the level plane is actually derived using a bubble in a vial and then using the lens it is transferred to the site. 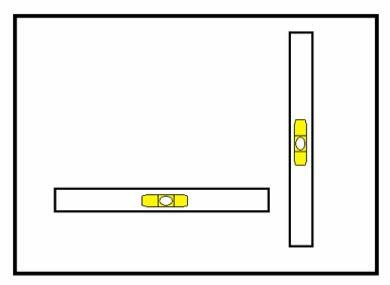 This is one of the more simple and elegant solutions to transferring levels from one place to another, however they will not establish a level plane. We explain how to do this and even make your own in our project about water levels. How does a Spirit or Bubble Level Work? 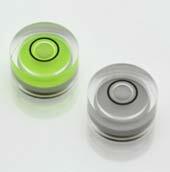 There is a small glass tube or vial containing alcohol with a little bubble sealed inside. The top of the vial or tube is ever so slightly bowed so that when the flat surface under the vial or level is absolutely horizontal the bubble will come to rest in exactly the middle of the tube or vial. This is usually marked with guide lines to make it easier to see. 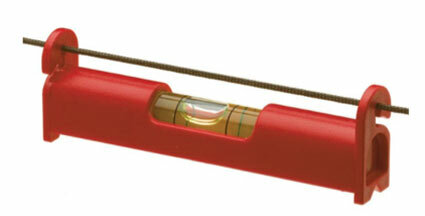 The accuracy of the level is determined by how curved the top of the vial or glass tube. The “flatter” it is the more sensitive it is and therefore more accurate it will be (in the right hands). A tube vial will be able to show the level in one plane but will tends to be easier to use and more accurate for hand use. The different planes will all need to be checked separately; widthways then lengthways and ideally across the diagonal too to get a completely horizontal surface. (A cross check level is often used for this – see types of level below). Using a Level in 2 planes to get a horizontal surface – the more checks the better! With a round bubble vial you can get the level in all planes in one go although they can be more fiddly to use without a firm base and a mechanism for fine adjustments, which is why they are most commonly used to level devices that have a tripod stand or similar stand. 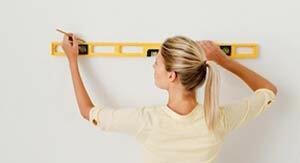 In the same way a spirit level can be used to measure true vertical surfaces, or what is called plumb in the trade. The same process is used however the level needs to have a vertical vial which will show the level of the perpendicular. On many occasions you want the surface to look level, but to actually be on a slight slope. This might be when laying a patio to ensure water runs off, or to have a slight slope in your screed. If this is the case rather than ensuring that the bubble is in the exact centre of the vial, between the guide lines, the bubble should be slightly off centre. Here it helps if you have a vial with multiple guidelines so that you can ensure that the bubble is in the same place at all paced along your (slightly off) horizontal surface. Once you have established the angle that you need the slope to be used can be transferred using the spirit level to ensure that you consistently keep to that slope. TIP: An old builders trick to getting the right level is to place the base of the spirit level in with the right level, then you can draw on to the top of the vial with a felt pen where the bubble comes to rest. Now as you work across the surface you can ensure that the level comes to the same point, so the bubble comes to rest at your felt pen mark. Remember to wipe the marks off when you are finished. Some spirit levels come with a 45o vial or even an adjustable vial. 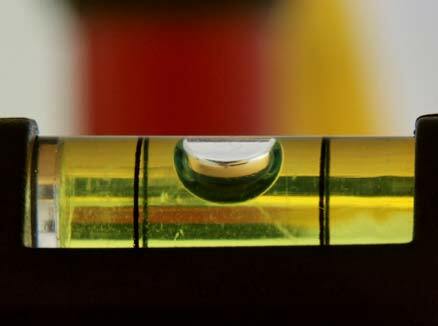 These can be used in the same way to establish the angle whether it is 45o or another angle set in the adjustable vial; you need to move the spirit level until the bubble is in the centre of the vial. At this point the level is at the required angle. 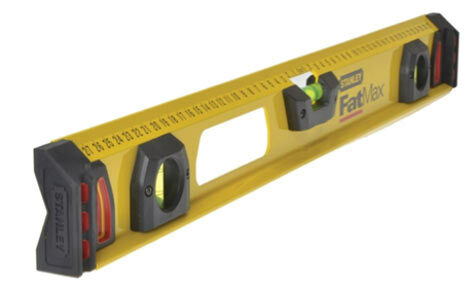 When you are looking to create a level, be it horizontally or vertically you need to be confident that the spirit level that you are using is accurate. The process for checking a level’s accuracy is very simple; effectively you are checking the level in two directions to see if there is a difference – the size of the difference is a measure of the inaccuracy, as ideally it should read the same in both directions. You can use this same process for the vials used for measuring vertical surfaces in exactly the same way, only by placing the level against a vertical surface. It is worth double checking your measurements twice so that you are sure of the accuracy. As this is a very easy test, we recommend regular checks, certainly do it before you make a purchase, or if you have dropped or think you might have damaged it. We check our level before we start a job, especially if we know it is one where we need to be highly accurate. Before we get into the different types of levels, there are some important features to look out for and are common to all, as essentially the bubble is the part that all these types of level use to do their job. The bigger the better when it comes to the bubble as it is easier to see. The issue is that the bubble size is determined by properties of the liquid, which will expand and contract as it get hot and cold which affects the size of the bubble. The bubble should always remain inside the reading lines. The sales patter will be about the liquids expansion confident and the guaranteed working temperatures. The better these are the more accurate but more expensive the level will be. Most levels nowadays have the liquid coloured so that it is easier to see the bubble. The colour will fade from the liquid over time and in the sun, but how long this takes is a mark of the quality, but of course you have no way to tell this in advance, except by a guaranty – and may be the price! These are lines inserted into the tube or vial or in some cases they are painted. These need to be clear and easy to see without impacting the movement of the bubble. The vial or tube is actually quite delicate and as such needs to be protected, however the level will be dropped and have a touch life especially if on a building site. The ends should be strong rubber or similar to reduce shock and the construction sturdy, but light weight. 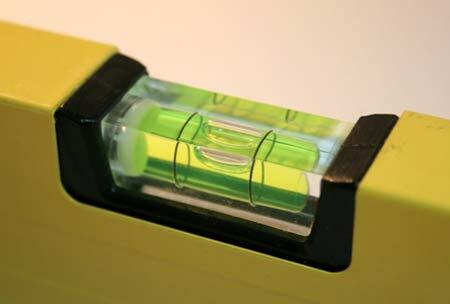 Look for shock proof vials and end caps when buying a spirit level. 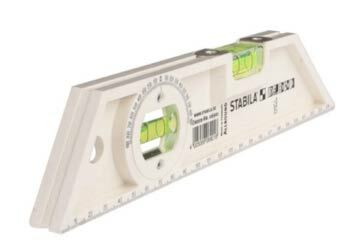 Depending on where you will be using your spirit level, you need the most robust body that you can get but will not damage the materials you are working with. Builders will use robust aluminium levels, however if working with more delicate materials such as a work top you might consider a softer body made of something like plastic. For accuracy, some aluminium levels will have one or more milled surface, which is a precision machined surface to ensure that the surface is absolutely flat and horizontal. 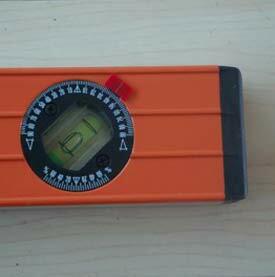 You need to be able to hold the spirit level in place to get an accurate reading so hand holds are helpful, particularly on the longer levels. This is a feature that some levels will have and it is a groove in the surface of the level which is designed to fit against pipes of conduit so that you can ensure that they are fitted horizontally or perpendicular. Some levels have magnets within their bodies so that they can be “stick” to metal pipes, scaffold poles or other metallic surfaces. This means that they can be used “hands free”. There are a lot of different types of spirit levels. To make things even more confusing they also have different names often depending on who or what they are being used for or sometimes how they are constructed. 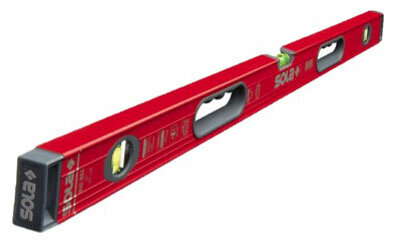 i-beam levels: the frame of the level is an “i” shape when looking at its end. They are also called Girder Levels (because they look like a girder in cross section). They have similar uses to a box level but tend to be a slightly less sturdy, cost effective alternative. 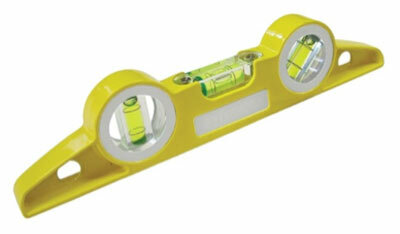 See our range of Girder levels here. 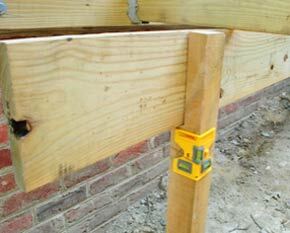 An Girder or I-Beam Level – Browse here now. 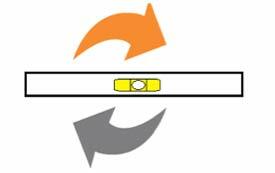 Box beam levels; also known as Box Level or Box Section because the frame is a rectangle, box shape. The best ones are not hollow but encase acrylic (or similar) to make them more robust. They are stronger than I-beam levels, but typically heavier. See more Box Levels here. A Box Section Level – shop here now! 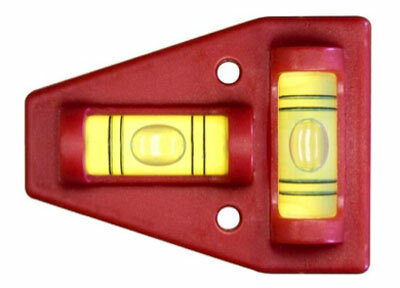 This is a typical torpedo level – See more here. Scaffold Level: A specialist variation on the torpedo level is the Scaffold Level. As the name implies it is ideal for use when erecting scaffolding, but also used by plumbers and others working with pipes or metal surfaces. They have magnets to “stick” to the pipes. Sometimes called a Boat Level. Pocket levels; these are small spirit levels as the name suggests, designed for quick use and often come with a belt clip mount and can be put in your pocket. Ideally they should have magnets and a v-groove for use with pipes and metallic surfaces. See our Pocket Levels here. A String Level hooked on a Line – Get one here. 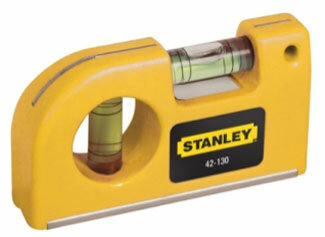 A 2D or Cross Check Level – Buy one here. 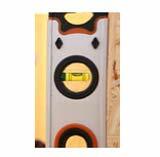 Post levels; This is a specialist level that is designed specifically for making sure that posts are plumb in all directions. The wrap around two sides of a post to measure the level in both horizontal planes. Most will have a third vial so that they can be used to ensure that horizontal rails, joists or other timbers, etc will be level. 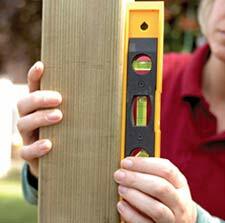 If you haven’t got a Spirit Level to hand or fancy making your own it is not actually that difficult. At the simplest you can put a marble or ball bearing on a flat surface and it will roll down any slope; when it does not roll away the surface is level. 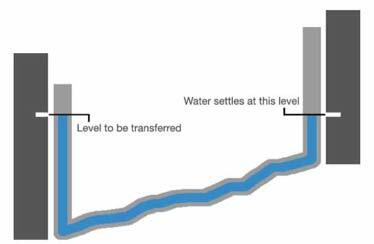 We describe how to make a Water Level in a separate project, and this is a very useful way to transfer levels. (Don’t worry, you can buy one here if you prefer). Water always finds a level so you know that the surface of standing water will be level. You can use this fact to find a level using a glass of water. Spirit Levels are a vital part of any toolkit but it is important to know how to use them and which type of level you should use. 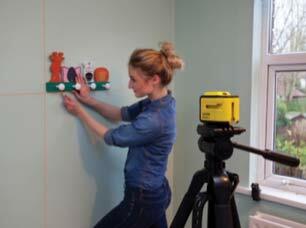 Hopefully this project has given you the confidence to get the right spirit levels for your needs.